The FOMC statement produced no changes to policy or outlook. The news, as a whole, is good for the market as it gives affirmation of positive economic growth and outlook for growth. The news is bullish for the dollar because outlook/expectation the FOMC would slow the pace of rate hikes had crept into the market. With high rates holding back real estate sales it looks like the FOMC could cause the economy to stall. The problem for them is that inflation is still on the rise and they need to take care of that. The Producer Price Index jumped 0.6% in October, more than double the expectation and 3X times hotter than the previous month, as input prices continue to rise. At the core level PPI rose a hotter than expected 0.5% as prices for basic materials at all levels show increased upward pressure in prices. The data is bullish or the dollar because it supports the FOMC’s decision to stand pat on rate hikes and may even increase the odds for a hike at the next meeting. 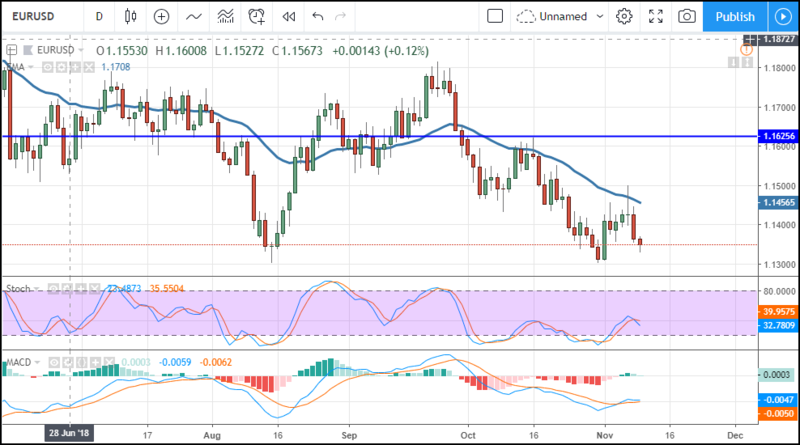 The EUR/USD moved lower on the news ad is approaching support at the 1.1300 level. The Dollar Index moved up more than 0.5% immediately following the FOMC release and is indicated higher. The PPI data had it edging higher in early trading and the indicators are rolling into a bullish trend-following signal. A move up will likely find resistance at the $97.20 level, a move above that would be bullish. There are two tokens exhibiting overtly bullish activity in the cryptocurrency market. The first is the Basic Attention Token which has been moving higher since Coinbase announced it would support the ERC-20 token. The BAT/USD advanced more than 125% over the past four weeks but has since fallen to retest support at a key level near 0.2950. While Coinbase is a driving factor in this coins move it is not the only one. The BAT is the native token of the Brave Browser system and both are gaining attention. The Brave Browser is a privacy-oriented web browser that pays users to watch ads, payments are made in BAT, and those payments can be redeemed for cash or to reward advertisers and publishers for their performance. Brave is expected to have +5 million users by the end of this year. The other token on the move is RCN, otherwise known as the Ripio network. Ripio is a peer-to-peer lending service that allows vetter borrowers use lent capital to purchase Bitcoin. It is headquarterd in South America and intended to service markets in that region. With BTC in wide use there is no reason this token won’t see big gains. The RCN/USD formed a bottom in August and September and about to confirm reversal. 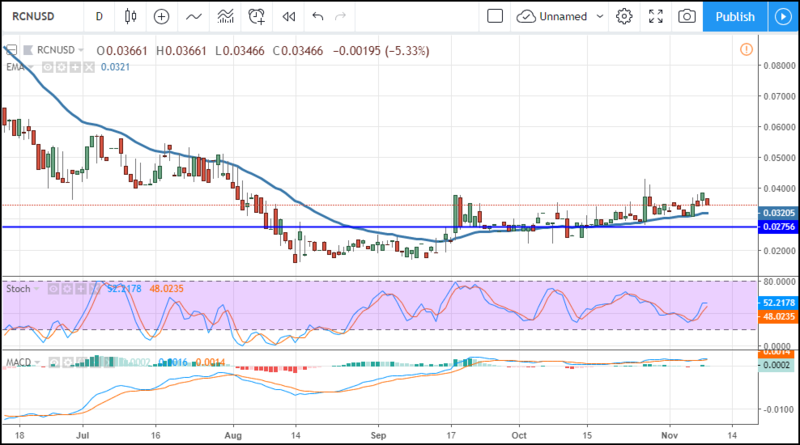 It is fighting with resistance at the $0.038 level, a break above that would be very bullish and likely take it up to $0.0525 in the near-term.